In protest against implementation of the Citizenship (Amendment) Bill, 2016, a number of organisations including the All Assam Students’ Union (AASU), Asom Sahitya Sabha, Asom Jatiyatabadi Chatra Parishad, All Tai Ahom Students’Union (ATASU) continue to stage demonstrations and take out rallies in different parts of Assam. 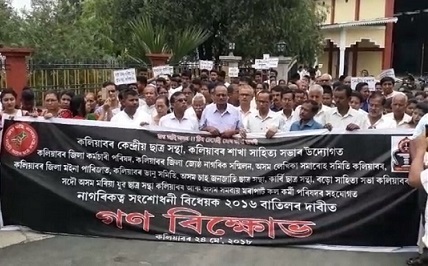 The Kaliabor unit of AASU and the Asom Sahitya Sabha jointly staged a demonstration demanding scrapping of the Citizenship (Amendment) Bill 2016 in Nagaon district on Thursday. Several other organisations representing various ethnic groups of the State along with locals also joined the protest programme. The activists also took out a rally as part of the protest programme on the National Highway 37 upto the Kaliabor SDO (Civil) office premises. The rally started from Kuwaritol. AASU vice-president Mani Madhab Mahanta also joined the protest at Kaliabor. The protesters submitted a memorandum before the SDO (Civil), Kaliabor, Bitopan Neog demanding scrapping of the Bill. 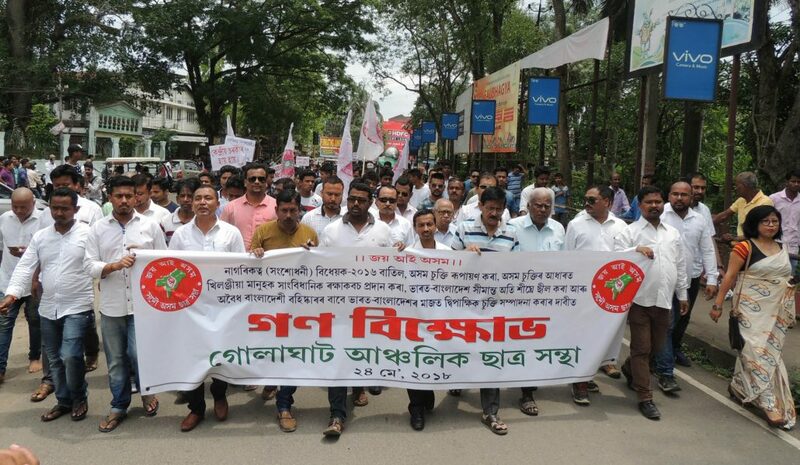 In Sivsagar district, the Gaurisagar unit of the AASU also staged protest against the Bill. The protesters shouted slogans like ‘Sarbananda Sonowal Hai Hai’, ‘Assam Government Hi Hai’, etc. during the protest. The AASU activists condemned the Central government’s move to grant Indian citizenship to the illegal migrants by implementing the Citizenship Bill. Further, the AASU leaders said that the Union would continue protest against the Bill until the Central government withdraws it. Gaurisagar unit of the Asom Jatiyatabadi Yuba Chatra Parishad (AJYCP) and Anusuchita Jati Mahila Parishad along with a large number of locals also joined the protest programme. In the same way, the regional unit of the Golaghat AASU also took out a huge rally in protest against implementation of the Bill, demanding sealing of the Indo-Bangla border, seeking safeguard of the indigenous people of Assam and signing of a bilateral agreement between India and Bangladesh for deportation of illegal foreigners from Bangladesh. In Goaghat, members of the All Tai Ahom Students’ Union (ATASU) after tonsuring their heads took out a protest rally against the Citizenship (Amendment) Bill 2016. The regional AASU units in Mangaldai and Jorhat also took out protest rallies demanding removal of the Citizenship (Amendment) Bill 2016.